The global augmented reality (AR) and virtual reality (VR) in the healthcare market is a multi-billion market which consists of a multitude of companies catering to different needs within hospitals, clinics, and education centres. The broad segments the market has been defined under are hardware, software, and services, among others. Hardware and software are the two leading segments contributing to 64.95% and 23.91% of the overall market, respectively. The hardware systems market is primarily driven by increasing surgeon’s demand for enhanced perception of depth during surgeries. The market segment comprises a broad range of products such as video systems, head-mounted displays, motion sensors, 360° cameras, and surgical displays, among others. The purpose of this study is to gain a holistic view of the global AR and VR healthcare market in terms of various influencing factors such as regional adoption trends, technological advancements, and pricing patterns. The scope of this report constitutes an in-depth study of the global AR and VR the healthcare market, including a thorough analysis of the products across different regions. The report presents the reader with an opportunity to unlock comprehensive insights with respect to the market and helps in forming well-informed strategic decisions. The research uncovers some of the substantial parameters that must be taken into consideration before entering the market. 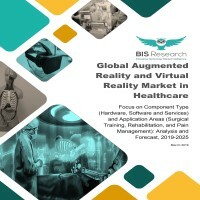 This research report aims at answering various aspects of the global AR and VR healthcare market with the help of key factors driving the market, restraints, and challenges that can possibly inhibit the overall market growth and the current growth opportunities that are likely to shape the future trajectory of the market expansion. The report includes an in-depth examination of the key ecosystem players and key strategies and developments taking place in this market. In addition, the report includes market dynamics (market drivers, opportunities, and challenges), and industry analysis. The research study considers the market share analysis for a comprehensive understanding of the global AR and VR in healthcare market and assesses the factors governing the same. Funding scenarios, Porter’s Five Forces analysis, patent analysis, opportunity matrix, detailed product mapping, pricing analysis, and growth share analysis by products and by region, has been included in the report. • What are the major market drivers, challenges, and opportunities in the global augmented Reality (AR) and virtual Reality (VR) in healthcare market? • What are the underlying structures resulting in the emerging trends within the global AR and VR in healthcare market? • How is each segment of the global AR and VR in healthcare market expected to grow during the forecast period and what is the anticipated revenue generated by each of the segments by the end of 2025? • What are the significant development strategies implemented by the major players in order to sustain in the competitive market? • What are the major hardware and software primarily being integrated in an AR and VR equipment? • What are the key success factors for companies to remain relevant and competitive in this crowded market? • What is the expected compound annual growth rate (CAGR) expected to be witnessed by the leading players in the market during the forecast period 2019-2025? • What are the major technological as well as regional adoption trends pertaining to the global AR and VR in healthcare market? • What are the major technologies employed in the global AR and VR in healthcare market? Which is the most dominating technology? • What is the growth potential of the global AR and VR healthcare market in North America, Europe, Asia-Pacific, Latin America, and Rest-of-the-World? The key players which have been contributing significantly to the global AR and VR in healthcare market include Alphabet Inc., Atheer, Augmedix, CAE Healthcare, DAQRI LLC, Echopixel, Firsthand Technology, Koninklijke Philips N.V., Medical Realities, Microsoft Corporation, Mindmaze, Orca Health, OssoVR, Psious, and Surgical Theater among others. The augmented reality (AR) and virtual reality (VR) market is witnessing significant technological advancements. Growth is mainly due to consumer’s interest in VR and AR gadgets which helps them in a real-time display of digital information. With respect to surgical navigation systems and study of the 3D anatomical structures in human, the concept of 3D structures has defined the current era. AR technology not only allows for better visualization of the human body, but also allows an improved augmented view of anatomical structures in real time. The healthcare sector has been consistently advancing with the adoption of cutting-edge technologies for better diagnostics and treatment. The increasing healthcare expenditure on technologies and the imminent need for effective solutions have been driving the AR market in the healthcare industry. Augmented reality provides the ability to project the organs or internal anatomy images of a patient in 3D on top of the actual anatomy so as to help in making the decisions regarding the most optimum procedure, becoming highly beneficial for doctors. The global AR and VR market provides the players with numerous opportunities to carve out a niche through investments in healthcare-related application areas such as surgical planning/treatment, surgical navigation, behavioral neurology/rehabilitation, and pain management. The global AR and VR market has been witnessing a steady growth. The market is expected to grow with a double digit CAGR of 23.13% during the forecast period, 2019-2025. As of 2018, the surgical planning, treatment, and surgical navigation application appeared to be among the largest focus areas for the market players (especially in the AR segment) comprising an estimated 42.4% of the overall AR and VR in the healthcare market. Based on regions, the global AR and VR market is segmented into North America, Europe, Asia-Pacific, and Rest-of-the-World, which have been studied and documented in detail to understand the various factors that are consistently responsible for shaping up the market. The key manufacturers who have been contributing significantly to the Global AR and VR market include Alphabet Inc., Atheer, Augmedix, CAE Healthcare, DAQRI LLC, Echopixel, Firsthand Technology, Koninklijke Philips N.V., Medical Realities, Microsoft Corporation, Mindmaze, Orca Health, OssoVR, Psious, and Surgical Theater.